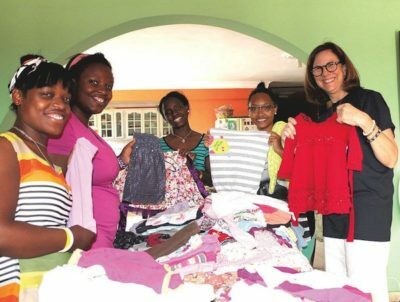 BABY CLOTHES donated by St. Brendan School, and delivered by Mary Fagnano (far right), are sorted by girls in the Dominican Republic. The Thrive in Joy Nick Fagnano Foundation held a “Day of Giving” last month to honor its namesake, the former Country Club Park resident tragically killed by lightning on Venice Beach in 2014. The second annual event didn’t limit the giving to just one day. In fact, each year the foundation recognizes 11 days of giving for the first 11 days of November in Nick’s honor, according to the foundation’s secretary Kris Williams. The number 11 is significant because whenever Nick saw the time 11:11 on his phone, he would make a wish. By midday on Nov. 11, Williams told the Chronicle that the foundation had received 113 individual donations, surpassing their goal of 111, amounting to more than $4,000. Funds raised go to support underserved schools in the Dominican Republic, a country that Nick was passionate about helping. As a student at St. Brendan’s School in St. Andrews Square, Nick once read about children in that country who loved baseball but couldn’t afford the sports equipment needed to play the game. What’s a kid to do? Nick organized his friends and collected used baseball equipment and sent it to the Dominican Republic. Nick’s parents, Jay and Mary Fagnano, have now made it their mission to build on their late son’s work. Since Nov. 2014 they have travelled six times to the Caribbean nation to work to improve conditions at schools and orphanages across the island. Visit thriveinjoy.org to learn more about the foundation.